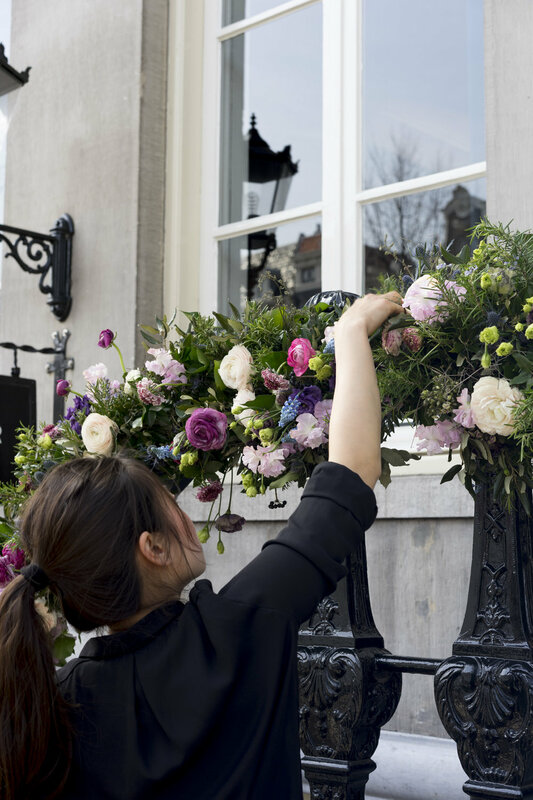 The beginning of Spring is a hugely anticipated event each year in Amsterdam. Not just because we are florists, and the bounty of breathtaking blooms are abundant, but it's finally a break from our chilly Winters. Most importantly because its the start of the wedding season... and the time for love! Jenna & Gavin were one of the first couples to be wed this Spring, and their wedding day was the first day of real sunshine, in what seemed like forever. This super sweet Scottish and American duo were a joy to design for, and were happy to leave a lot of the details up to us. And we have to say that we got just a wee-bit carried away! The venue was one of Amsteram's finest, the Pulitzer Amsterdam, and boy, is it a treat to decorate in a residence with this calibre. The ceremony took place in the Saxenburg Room, a room adorned with 18th century artwork, deep purple colouring and a stunning Louis XV style mantelpiece from 1750 providing the "I do" backdrop. The ceremony wouldn't be complete without their extremely well-behaved flowerpup, the Puerto Rican 'Coconut Monkey' (as known to his Instagram followers! ), with his own custom floral collar! Drinks ensued in Saxenburg Galleries, where the theme changed to deep blues, and so did the flowers. A beautiful cruise whisked the guests around Amsterdam's sparkling canals, before returning portside to the magical dining experience that was waiting for them in the Garden Room. The florals were designed around the hotel's heritage, colour scheme and decoration and also echoed the couple's wish to dine underneath their own personal enchanted garden. Golden metal frames were custom-made for the occasion, which supported larger than life floral 'rooftop gardens' for the guests, filled with tulips, poppies, snapdragons, golden painted grasses, ranunculus, royal blue delphinium, dill, and wild branches. A surprise for the groom, as a nod to his Scottish heritage, was a mini 'upside-down' garden which hung underneath the floral pieces, facing the diners. Flowers spilled from small brass vases on the tables to complete the picture. Our whole floral team was involved in this special event, and we were thrilled with the results! Thanks Jenna & Gavin, for believing in us, and we wish you a beautiful life together.